It was discovered in a shallow cremation grave at Chilham Castle, Kent, in 1993, along with two brooches. Culture Minister Barbara Follett has placed a ban on the items leaving the UK. The ban will be reviewed in May. The ruling follows a recommendation by the Reviewing Committee on the Export of Works of Art and Objects of Cultural Interest, administered by the Museums, Libraries and Archives Council (MLA). Dr Catherine Johns, of the reviewing committee, said: "The mirror is an important example of a rare and quintessentially British type of export. "The study of such mirrors adds significantly to our understanding of the sophisticated art and complex society of late Iron Age Britain." The committee recommended that the export decision be deferred, because of the mirror's "outstanding significance for the study of Celtic art and the Iron Age archaeology" in Kent. 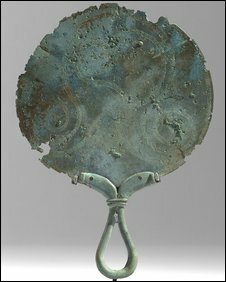 The mirror is the earliest example of only 17 complete decorated Iron Age mirrors found in Britain. The period of the ban could be extended until 1 August if a serious intention to raise the £35,000 recommended price is made.